Have Fun Storming the Library! One of the most common tactics non-profits have to draw attention to their cause is to declare a day, a week, a month. For example, October is well known to be Breast Cancer Awareness Month. You may even know that it’s also Anti-Bullying Awareness Month. According to this governmental website, the month represents 11 different causes including SIDS, Eye Injury Prevention, Down’s Syndrome, Physical Therapy, Medical Librarians, and more. And that doesn’t even count the more than a dozen other special weeks and days, such as Drive Safely Work Week, Walk to School Day, Mental Illness Awareness Week, World Food Day, Psoriasis Day and International Stuttering Awareness Day. And let’s face it, (almost) all of these causes are important. There are any number of reasons why they should be recognized. But at some point, we may have to consider that we’re asking an awful lot of of October, especially considering we haven’t even gotten to Halloween yet. And October has it easy compared to May, which has no fewer than 17 month descriptions (including National Mediterranean Diet Month, Ultraviolet Awareness Month and my personal favorite, National Toxic Encephalopathy and Chemical Injury Awareness Month), 10 weeks and 10 days devoted to a wide swath of other worthy causes. But when I learned that this week is “Banned books week,” well, I could hardly wait to sound the bugles. As an avid reader, the prospect of books being actually banned breaks my heart, no matter how inappropriate the subject. 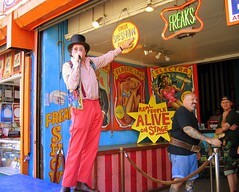 Sideshow Act: She can sing! She can read! Right this way, ladies and gentlemen! It’s the one, the only, the amazing, singing, dancing and reading K!